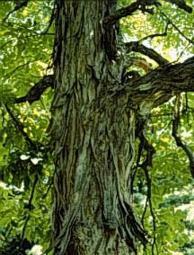 The Shagbark Hickory tree has an ashy gray bark similar to birch trees except its bark separates into long strips, which give the trunk it's shaggy look. The Shagbark Hickory tree is tall and straight and can grow to about 100 feet tall. The Shagbark Hickories branches can spread to 25 feet, the lower branches somewhat droop while the upper branches are upright. The branches in the middle are just about horizontal. The wood of this tree is strong and tough. The Shagbark has both male and female flowers. Male flowers grow in bundles called catkins and female flowers are in clusters called petallets. broad, toothed leaflets. The leaflets can be smooth or hairy and can be up to 10 inches long and 5 inches broad. The twigs bear brown buds. The nuts have thick husks, but the shell inside is thin and is edible with a sweet taste. The Shagbark hickory tree usually grows among oak trees. It grows in wet and dry areas, but grows better in well-drained soils. The Shagbark Hickory tree has long taprooms which grow straight down into the ground to help the tree get extra water if there is a drought. These roots will be helpful to the life of the tree. The Shagbark Hickory tree has many uses, some of them include: sports equipment, furniture, or as a smoke wood for meats. The nuts of the Shagbark tree are also edible and humans and squirrels both compete for these nuts. But if I were you I wouldn't eat one! The Shagbark Hickory tree is very common in the wild especially in the Eastern forests of the United States. by Will J. R. 2001. Ketchum, Richard M. The Secret Life of the Forest. New York: American Heritage Press. 1970. Macquitty, Miranda. Trees. New York: Alfred A. Knopf Inc. 1992.